This post is sponsored by Oak Meadow – visit their website to learn more about their science programs. For years, I have heard homeschoolers complain about how hard it is to find quality secular science programs, especially for middle schoolers. When I am looking for homeschool programs, I want something that is easy to teach, hands-on, challenging and interesting for kids. I want the program to be fun enough to hold my child’s attention, but also to challenge them and go deep into the subject matter. This year, Bug is working on Oak Meadow’s Grade Eight Physical Science, and recently, he tackled a lesson on light energy and the electromagnetic spectrum. 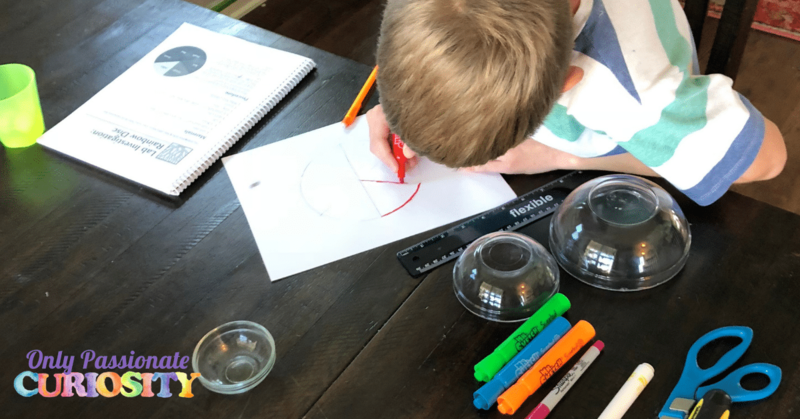 I am hoping I am not the only homeschool mom in the world whose eyes glaze over a little bit when talking about light energy. With the exception of what I learned from Mrs. Frizzle and the Magic School Bus, I am not sure I know anything on the subject. Thankfully, this science lesson started with reading from Bug’s student book to get us both up to speed. The biggest lesson learned here is that while white light appears to have no color, it’s actually made up of many different wavelengths that are clumped together. When the light hits an object, that object absorbs some wavelengths and reflects others. You see the color wavelength that is being reflected at you. White and black are not actually colors – white objects reflect all visible wavelengths, which combine and appear white, ad black absorbs all visible light – so black is an absence of colors. Oak Meadow always does an excellent job of providing a lot of different activity options from which to choose. I don’t always make Bug do all of them although, in science class, he typically does. In language arts, it’s a different story. 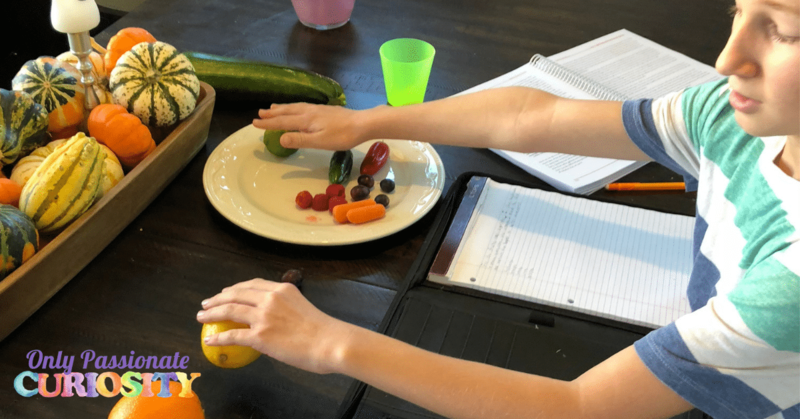 This time, he started by making a list of fruits and vegetables and arranging them in order of those who reflected the longest wavelength of those who reflected the shortest wavelength. He did a research project to learn more about invisible light waves (think microwaves or x-ray waves). He looked around the house and made a list of illuminated objects and luminous objects (and then explained to me the difference between these things). Finally, Bug finished the week’s lesson with a written summary of what he learned (using the weekly test as a writing prompt) and with a hands-on experiment. It’s easy to talk about how light absorbs, but for this to sink in, an experiment is in order. For this lesson, we created a Rainbow Disk (also known as a disappearing color wheel). You create the disk by coloring the rainbow on one side, putting one color in each wedge. When you spin the disk fast enough, the colors combine, and the paper appears white instead of colored. Oak Meadow offers stand-alone science for grades 5-8 (I own them all and love them all) and for high school students (I have not yet tried their high school programs, but have confidence in Oak Meadow enough to say they are probably stellar programs). 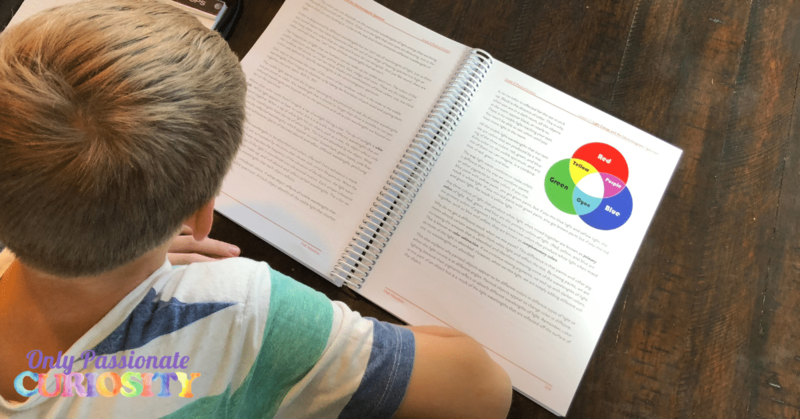 Each grade level covers a different topic, and while they don’t have to be done in order, the expectations for the student grow each year, and higher grade levels are more challenging than lower levels. The seventh and eighth-grade programs add a lab manual and spend a considerable amount of time focusing on the scientific method, experiments, and labs. These programs are entirely secular, are reading based, and include a variety of hands-on, research-based, and creative assignments. Of all the middle school science programs on the market, Oak Meadow is my personal favorite. See all of Oak Meadow’s curriculum offerings here.